I was asked to participate in the California Almonds #CrunchOn campaign as a member of the Healthy Aperture Blogger Network. I was compensated for my time and also received free samples for recipe testing. 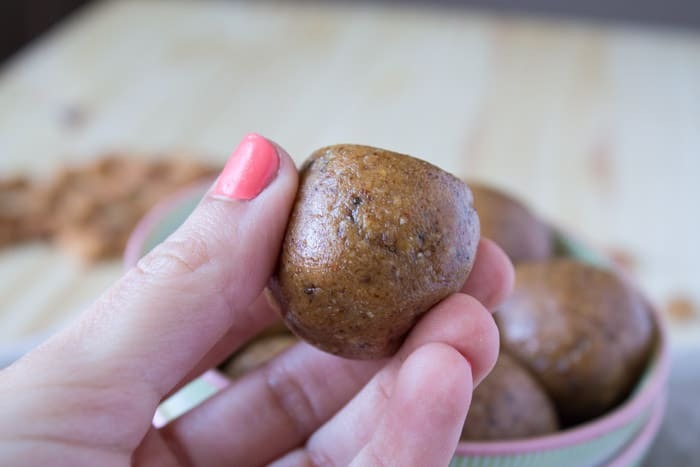 Almond butter and jelly energy bites packed with chia, hemp and flax seeds are the perfect energy-boosting snack to power you though the day. It’s almond butter jelly time!!! Almond butter and jelly sandwiches are my jam (pun intended). I used to eat almond butter and strawberry jam sandwiches for lunch every day in high school. No joke. And I still love them to this day. Heck, I even sometimes eat them for breakfast on toasted bread. You know how those certain foods from your childhood just bring you back to a simpler time? AB & J that food for me. I love how easy they are to transport too. If you know you’re going to be on-the-go all day, you can easily throw one of them into your bag…except when they get kind smooshed and you’ve got jelly time all over your ziplock or saran wrap. If you’re hesitant to pack a sandwich in your bag or you want an even quicker grab-n-go snack that still brings you back to a simpler time, I’ve got just the solution: almond butter and jelly energy bites! It’s hard to find snacks that travel well though. Fruit can get crushed in your bag. Eggs can get smelly (and can cause you to receive dirty looks from the person next to you). And bars can be, well, not so healthy if you’re not careful. 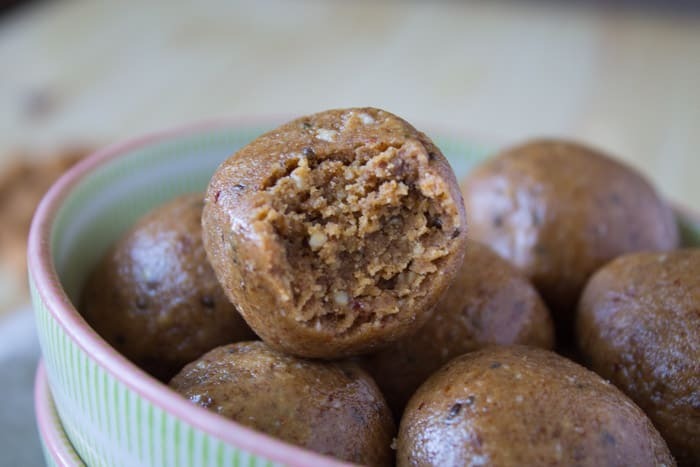 Which is why I LOVE these homemade energy bites. You can just pop a few in your mouth for fuel and be ready and raring to go! 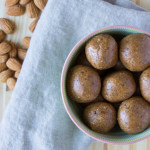 Plus, they’re packed with energy boosting ingredients like almonds, chia, flax, and hemp seeds. ALL THE SEEDS. Just one ounce of almonds per day provides a powerful combination of protein (6 g), fiber (4 g), good fats (13 g), Vitamin E (35% DV), magnesium (20% DV) and calcium (8% DV). And if you’re pressed for time, you can make a big batch (double the recipe) ahead of time for the week or month and always store them in the freezer if need be! 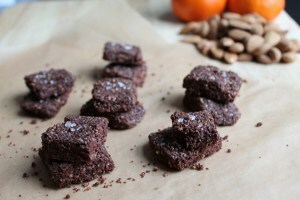 In a food processor, pulse almonds and dates to a fine, crumb-like texture. Add almond butter, raisins, and seeds and pulse to combine. Cover and refrigerate for 20-30 minutes. Roll mixture into balls and place onto a wax or parchment paper lined baking sheet. Refrigerate until ready to serve. 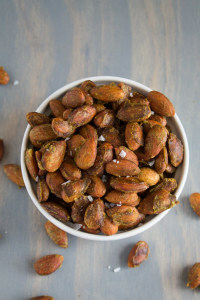 Tell me, what’s your fave way to use almonds? How do you use them to fuel your day? Looking for other almond snacks? I love using dates in these kinds of snacks. I’ll have to try these soon! There is no such thing as too many bite recipes pinned to my snacks board. Added! Bites make the best snacks! Couldn’t agree more! mmm, these balls look delicious! I have some almond butter in my pantry I’ve been meaning to use up. I think I found the perfect snack!